One person died early Sunday after being shot in Discovery Bay, according to the Contra Costa County Sheriff's Department. Sergio Quintana reports. 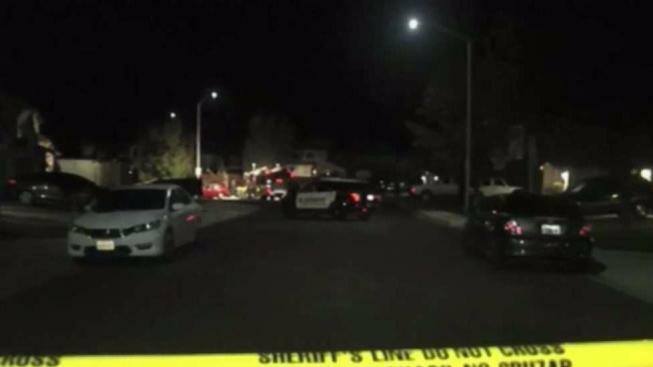 One person died early Sunday after being shot in Discovery Bay, according to the Contra Costa County Sheriff's Department. Detectives believe the shooting followed a "neighborhood disturbance," and two vehicles packed with "several" people in their teens or early 20s are believed to be connected to the shooting, according to sheriff's spokesperson Jimmy Lee. According to officials, deputies were first called out for reports of a disturbance in the neighborhood. Soon after, people started calling about gunshots. The victim, who has been identified only as a 48-year-old Discovery Bay resident, was found along the 1700 block of Wilde Drive shortly after 12:45 a.m., according to Lee. First responders tried to save the victim, but the victim was later pronounced dead, according to Lee. One of the cars in question is believed to be a matte gray mid-sized car, possibly a Dodge Challenger or Ford Mustang, according to Lee. The other is believed to be a red Mitsubishi Eclipse. Local residents say the victim often walked his dog in the neighborhood and even told people speeding through the streets to slow down. Some neighbors say that may have been what led to the confrontation. "He didn't want to start any trouble or anything like that," said Eunice Silva, a local resident. "It's just sad that it happened because he's a really good friend." Anyone with information about the shooting is encouraged to call the Contra Costa County Office of the Sheriff Investigation Division at 925-404-4200.